Manyatta Rock Camp is a warm-hearted bush retreat that welcomes you to a world of inner peace, contentment and a rich variety of animal, bird and tree life. This exclusive rock lodge, Manyatta, is a warm-hearted bush retreat that welcomes guests to a world of inner peace, satisfaction and a rich variety of animal, bird and plant life. Manyatta Rock Camp inspires guests to explore the wonders of nature from the comfort of the luxurious, air-conditioned, en-suite bungalows with open air showers or from the cool, tranquil waters of the rock pool. 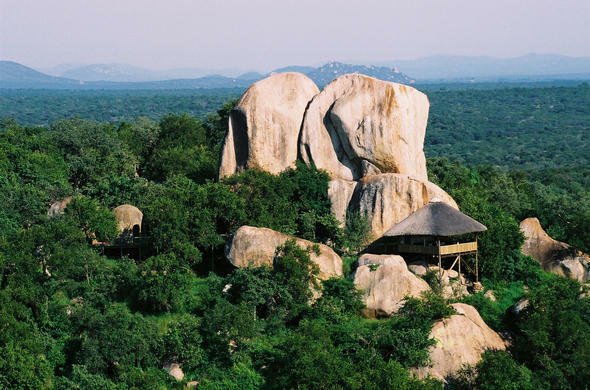 You can gaze out over African vistas from your own private deck and watch African wildlife pass by undisturbed, or take a closer look at the smaller creatures that carve their own niches in the camp's monolithic boulders. Manyatta Rock Camp takes great care in preparing the finest ingredients to create a true Smorgasbord of distinct cuisine, and a touch of Nouvelle flair and class. Enjoy the outside with the African celestial splendour as a backdrop and a Jackal's howl as mood-music.